Disclaimer: This story is about fine wine. It includes frank talk about acidity, texture, and mouthfeel. Please promptly remove the stick from inside your rear, pop open whatever you like to drink (no judgments here) and—for the sake of your own health—try to lighten up. 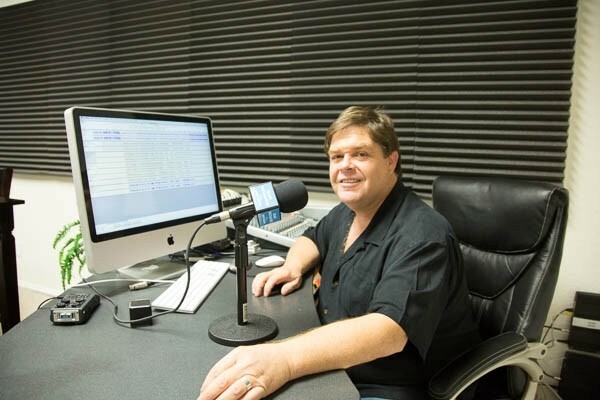 I am now going to attempt to blow your mind as thoroughly as radio host David Wilson blew mine during a recent interview at his Atascadero-based Grape Encounters studio. In other words, you are about the have an encounter … of the wine kind. Don’t worry—you are in fabulous company: An impressive swath of local chefs, winemakers, and even Sunset Magazine Wine Editor Sarah Schneider are all regulars. A white board covered in signatures hangs proudly on Wilson’s wall, including drawings and inside jokes from The New Wine Country Cookbook author Brigit Binns, JUSTIN Winery Executive Chef Justin Picard, and Artisan Chef/Owner Chris Kobayashi, among dozens more. WINE FOR THE PEOPLE: Grape Encounters Radio Host David Wilson isn’t afraid to question the wine status quo. 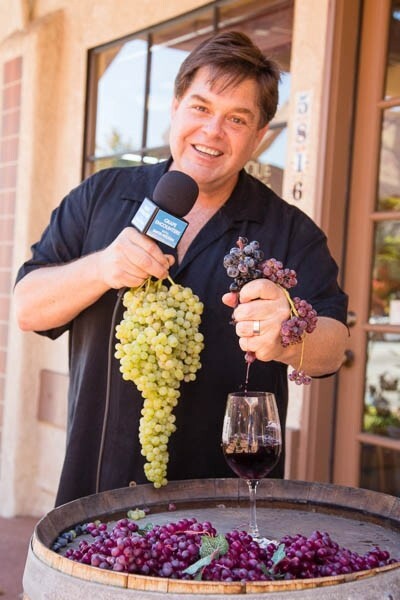 His show, produced in Atascadero and broadcast over about 30 stations nationwide, is all about squeezing as much joy out of the wine tasting experience as possible. The studio, located in Atascadero’s El Paseo Plaza off Traffic Way, is adjacent to Wilson’s wine retail shop. A liquor license for the space is pending. “I want to be able to sit down and have a glass of wine with people,” Wilson said. Luckily for the radio host, this is a huge part of his job description. However, he’s not satisfied to sit pretty, pinky in air. During our interview, Wilson passionately discussed public perception of shiny bottles, sparkling glass decanters, and embossed labels emblazoned with billowy script. What words do these images conjure up? For me, it might be: “Anxiety.” “Expensive.” And “Chewy tannins whatthewhat?” And I actually write about wine on a regular basis. This is where Grape Encounters Radio comes in. Perhaps you’ve already heard Wilson’s jovial laughter and honest advice while flipping through 92.5 The KRUSH. Although Wilson loves to talk about the act of drinking wine, he’s really a “wine people” person at heart. During our chat, he was routinely interrupted by calls from Napa Valley, which has yet to recover from its 6.0 magnitude quake. Wilson is committed to connecting the act of wine drinking—which we can probably all agree should be pleasurable—to the real world. He’s mixing bottles himself, adding a few ice cubs when he feels like it, and broadcasting the true, candid stories of winemakers from the Central Coast and beyond. No fancy descriptors about “crème de cassis” necessary. 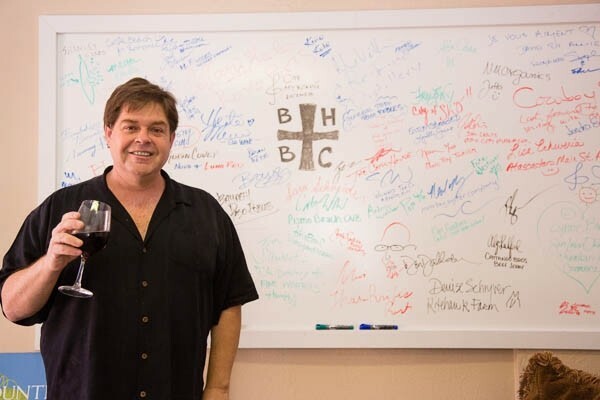 LEAVING THEIR MARK: Local chefs, winemakers, beer brewers, cookbook authors, business owners, and general wine lovers sign their names on David Wilson’s famous white board, located within his Grape Encounters Radio Studio in Atascadero. Wilson and his wife, Annie (they met at a L.A. International Wine Competition), moved to Templeton about a year ago. The radio host, who downsized from a 4,500-square-foot-home to a 1,000-square-foot rental located on a working vineyard, has lived many lives before landing in wine country. He was Pepperdine University’s speech and debate coach, a Southern California marketing man, a political spokesperson, and owner of his own broad-based marketing firm, which, at its peak, was one of the largest players in regional L.A. television and radio. Most recently, he lived and worked out of Palm Desert. “I now hate marketing,” Wilson said flatly. It’s obvious that he’s found his calling. In 2008, the L.A. commuter was living in Lake Arrowhead, where he had built a 23-employee marketing operation complete with sound studios, editing bays, and plenty of excess stress. As Wilson tells the story, it was on a tipsy New Year’s Eve night, “after a significant amount of truly outstanding tequila,” that he and a radio bigwig pal hatched the idea for a campy talk radio show focused on bringing food and wine back into the hands of the people. Wilson began work on the project in earnest, and the show, “A Quick Bite,” quickly climbed up the ranks at ABC Radio. A Santa Ynez Valley radio station owner suggested another novel idea: With Wine Country relatively nearby, why not zero in on the winemakers, vintners, and grapes themselves? According to the station owner, the last wine talk show host was so pretentious no one could keep the dial fixed. IN THE STUDIO: Grape Encounters Radio Host David Wilson is a brash, gregarious, and clever collector with a refreshingly simple attitude towards wine. The host reports on winemakers’ stories, checks in with wine regions around the world, and tackles the kinds of topics many wine drinkers are too scared to ask. Amazingly, no angry mob materialized. The No. 1 show evolved into what listeners across the country know as Grape Encounters, which airs on nearly 30 stations and the KRUSH daily. Recent episodes have tackled how to ascertain if the wine you’re buying is an anonymously produced “orphan wine” from a “phantom winery” as well as how music, ambiance, and even the color of a room can affect how one judge’s a particular vintage. Wilson has chatted up winemakers in emerging areas like Idaho, faraway lands like China, and has even wrangled internationally renowned sommeliers into offering playful asides, like his Oscar-themed episode that paired wines with Best Picture nominees. This is why Wilson pooh-poohs the word “aficionado,” and instead, calls himself a wine collector and humble guide. He’ll tell you point blank: What a consenting adult does in his or her own home, with his or her own bottle of merlot, is nobody’s business.